Dive Season Kick Off, Anambas LiveAboard Weekend Trip! ANAMBAS weekend Dive trip - Reef, Wreck and possibly Whalesharks! On March 29th we’re going on a LiveAboard weekend trip again to Anambas (Indonesia) to dive the coral reef, hopefully find the whalesharks (fair chance) and dive the famous Igara wreck on our way back. This is a live-aboard trip so we leave Friday night after work, we dive on Saturday and Sunday and that evening you’re back in Singapore. We live, sleep, dine/wine on board and dive from the ship. 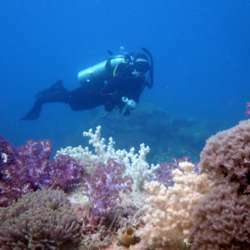 This is a perfect way to enjoy and maximize the diving in a weekend. The trip includes the boat trip, full board accommodation (3 meals per day), free snacks, fruit, tea, coffee, water and up to 6 guided dives. It excludes renting dive gear, alcoholic beverages and softdrinks, insurance and tips. Insurance is strongly recommended. Trip cost varies from Protected content - Protected content depending on the room type. Contact me for details.